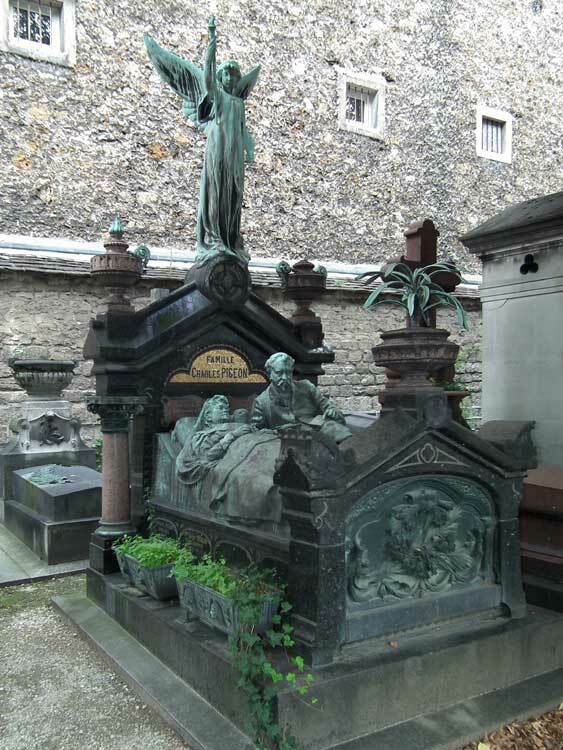 To modern eyes this family monument, with the deceased in bed together fully clothed, is somewhat ridiculous. Today, this grave is what Charles Pigeon is remembered for, but in the late 19th century he invented a gasoline lantern that would not explode, making his fortune. He sold lamps for miners and cyclists and was one of the earliest entrepreneurs to realise the value a company logo -- in his case, a pigeon standing on a globe and holding a lamp in its beak. Despite the incongruity of the couple's attire versus their setting, this is a tender scene of a loving husband and wife. He is working with a pencil and notebook, no doubt making jottings and sketches of a new idea, whilst his wife looks on attentively, ready to respond if asked her opinion. Above them, the angel holds his patented Pigeon lamp.